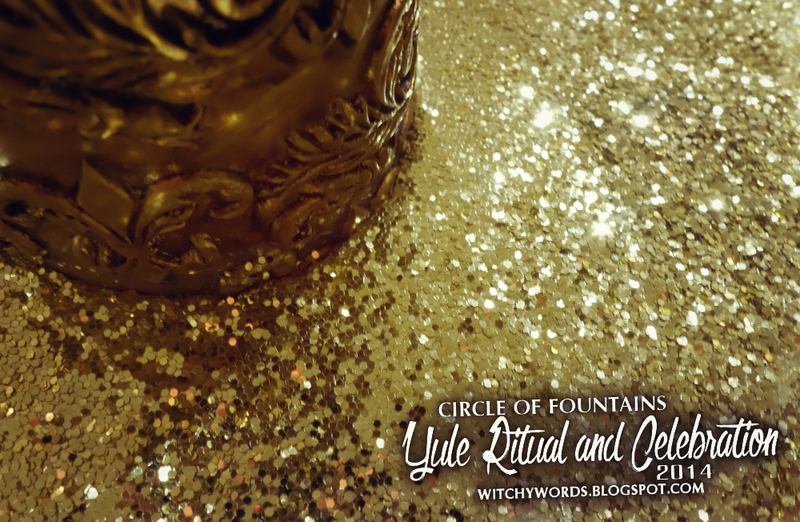 This post will cover the Yule ritual and celebration held by the Circle of Fountains. 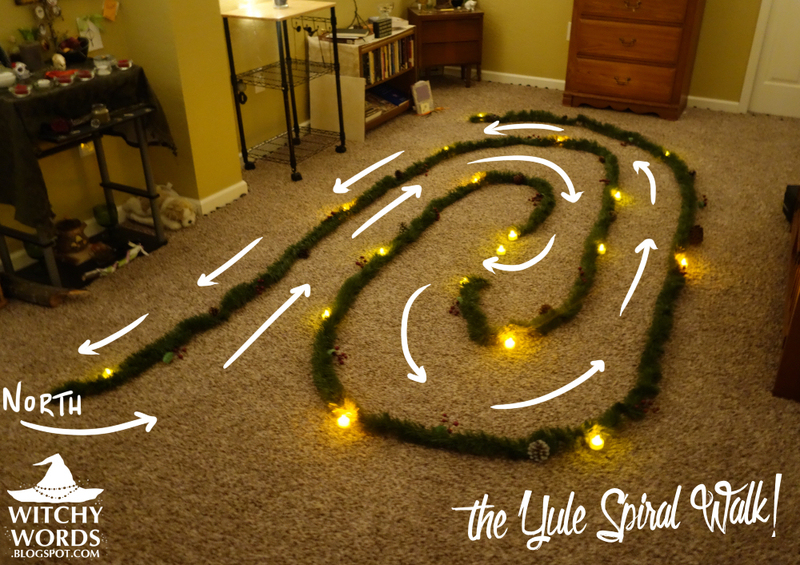 For Liithi Lushede's public Yule ritual, click here! 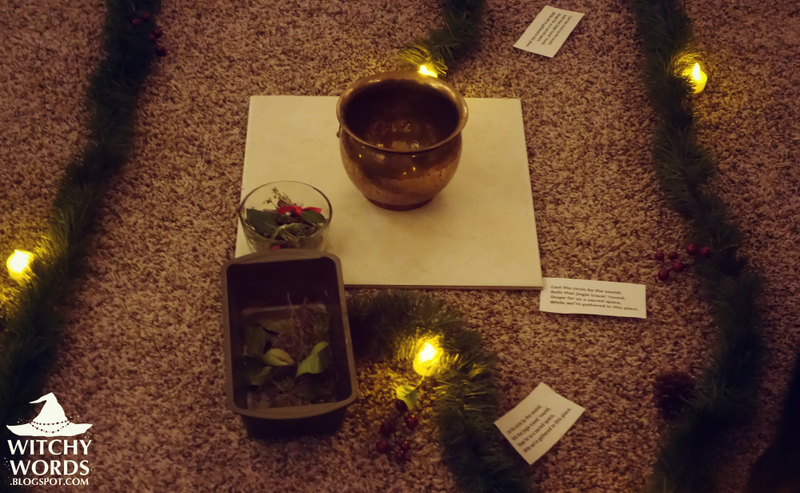 For Circle of Open Traditions 2012 Yule ritual, click here! 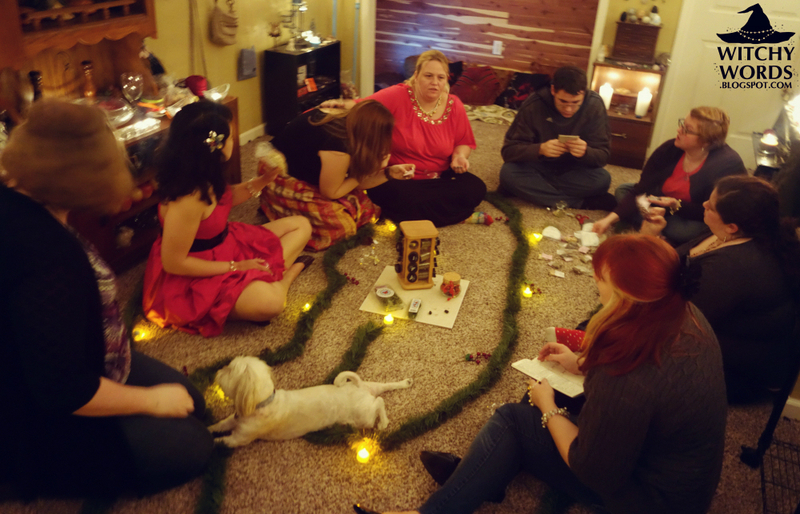 Circle of Fountain's Yule ritual was written and hosted by me this year! 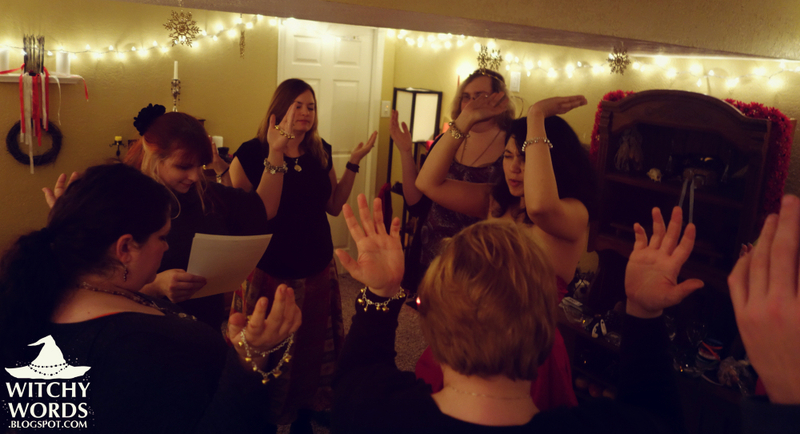 Held the day after the solstice, we honored many of my favorite traditions for the sabbat. Yule, sometimes called the Winter Solstice or Midwinter, honors the longest night of the year. After this night, the days get progressively longer and the nights shorter. For some, this is the day of the Horned God's rebirth, a deity often represented by the sun. For others, this is a time to honor the darkness and the spark of light that gets them through that period. For us, the evening began by turning off all electronics and lights. I then stepped outside to ring in the coming of the sun with a chain of bells while waiting for my circlemates to arrive. As they did, some of them chose to join me! We then returned to the darkness of the house. 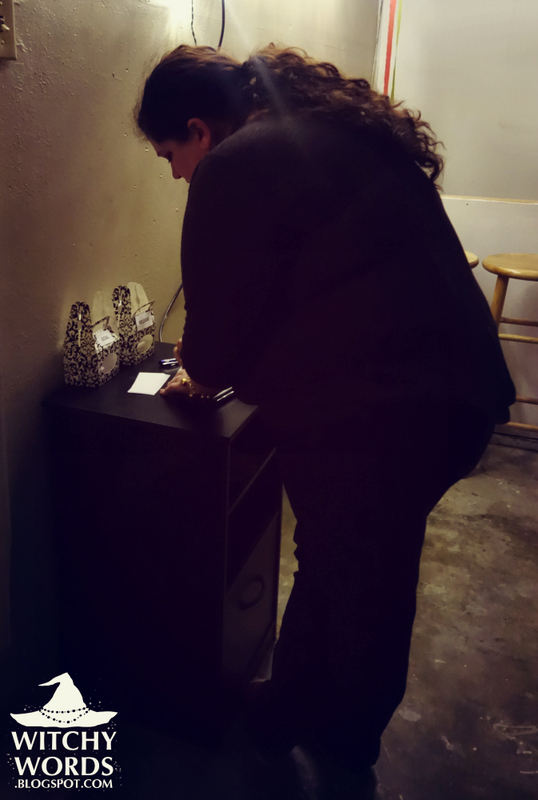 Guided by a single lit candle, I read a short introduction and blessed the altar, lighting it for the sabbat. 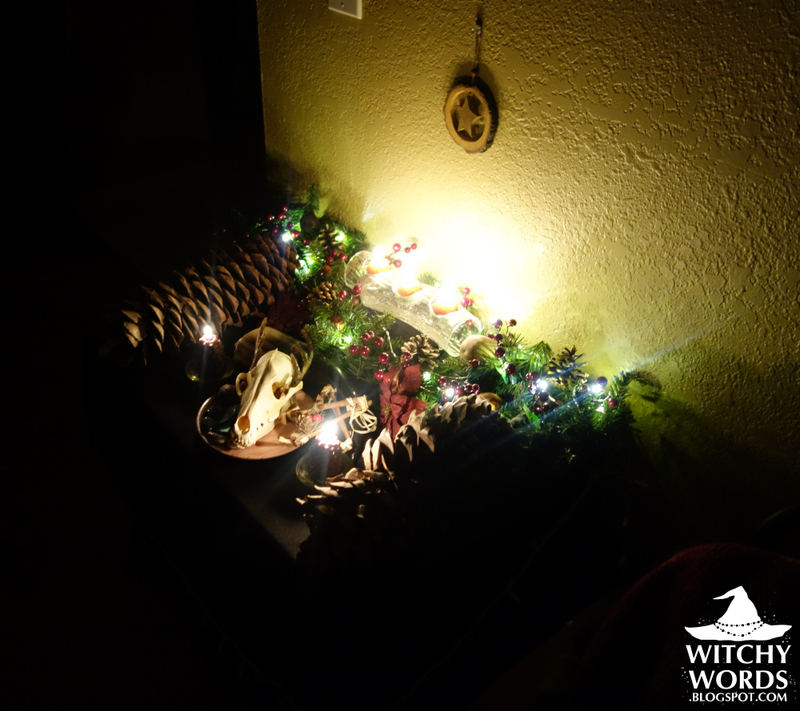 To see more pictures of my 2014 Yule altar and what it represents, click here! 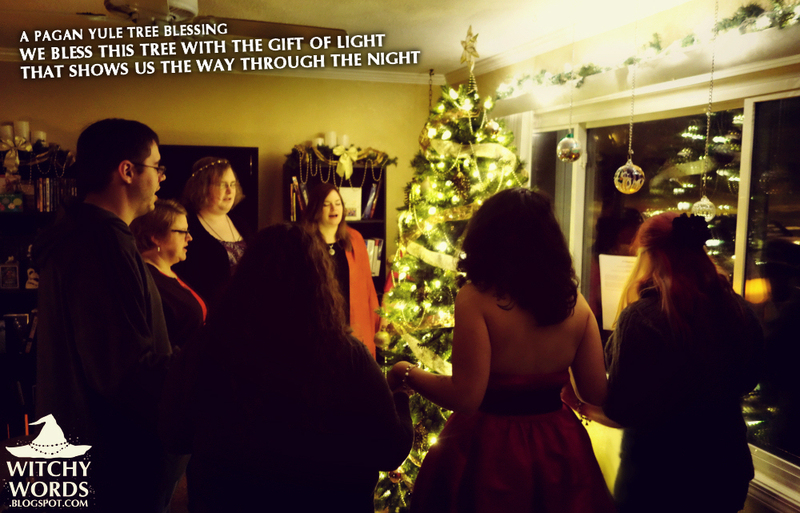 We then gathered around the tree in the darkness as I stated a blessing. We chanted the last line of the blessing over and over until my husband flipped on the lights and we opened our eyes! 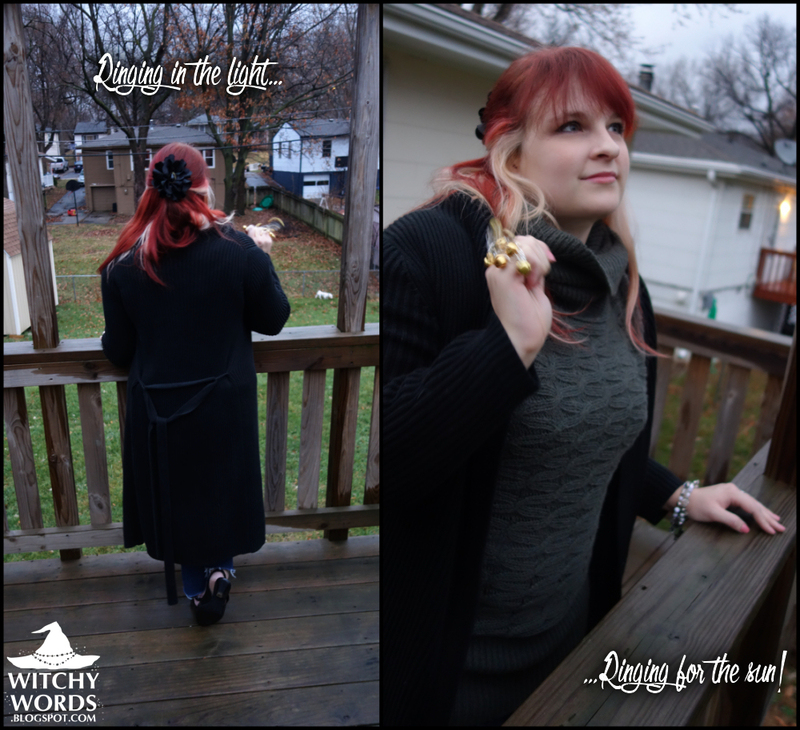 We took the following moments to light candles throughout the house and prepared for dinner. While waiting on the finishing touches, circlemates could write a single goal for the upcoming year and a single thing that they wanted to release for 2015. They filed each of these in the appropriate boxes. We'll be opening these next Yule to see how we did! 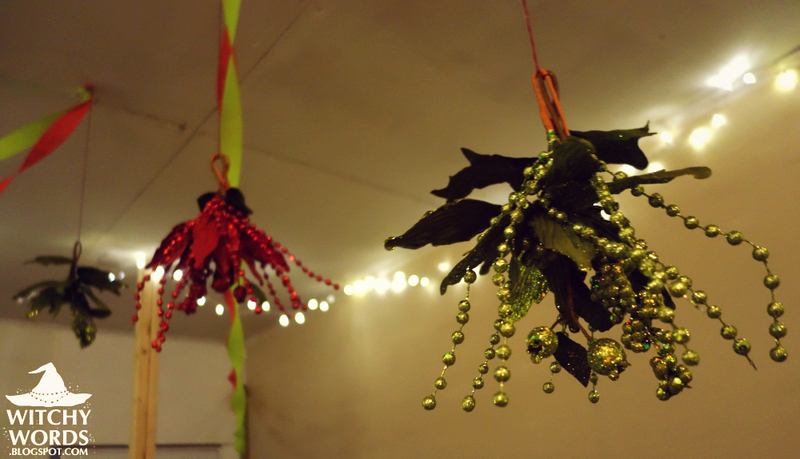 Our fifth room was appropriately decorated for the holiday in colors of red and green with faux holly and ribbon. Upon the table were three candles in red with pine cone candle holders. 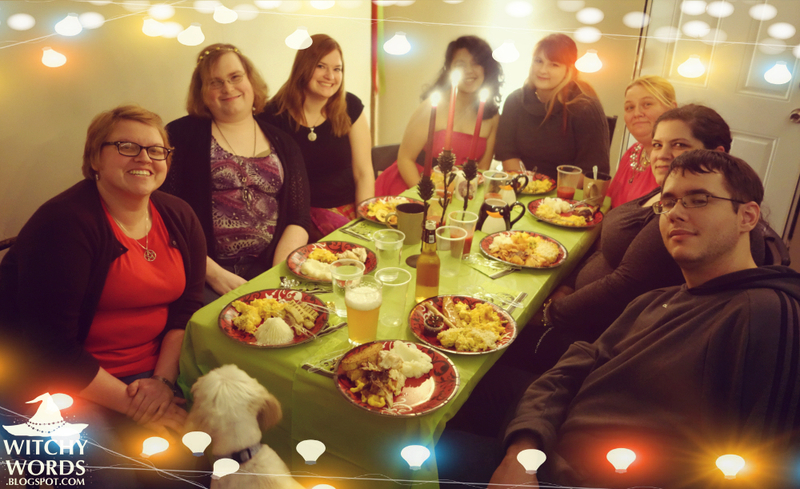 For dinner, we had an incredible feast - everything from chicken to homemade macaroni and cheese to mashed potatoes and more! It was absolutely amazing and very filling! After dinner had settled, we headed downstairs by candlelight. 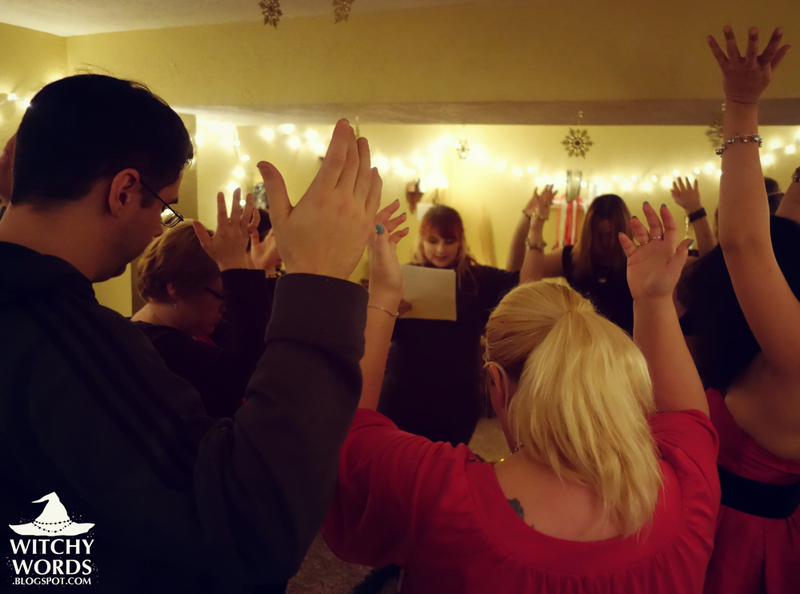 Each member was given a small slip of paper with a four-line chant that we would use to raise power and cast the circle. With the music above as our guide, we entered from the north side of the spiritual room and walked the spiral while shaking our bells in tune and chanting. "Cast the circle by the sound. Bells that jingle travel 'round. While we're gathered in this place." Lifting my hands in the air, I asked for the energies, the earth and the old gods to bless us, guiding us into the light. I asked each member to step forward and call upon an energy, spirit, ancestor or deity whom they associated with this time of darkness, the spark of light and the gifts of life. 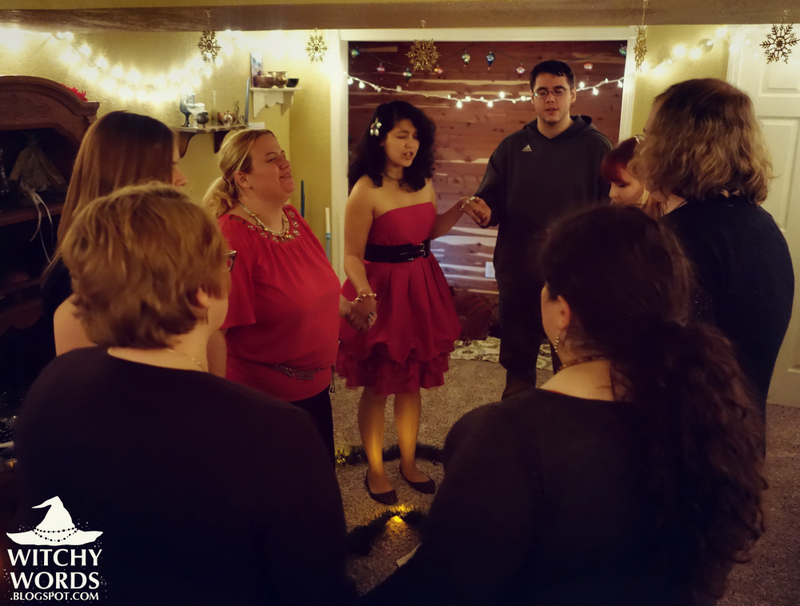 This is always a part of our rituals as many of us have differing beliefs; it gives everyone a chance to bring their personal beliefs to the circle! 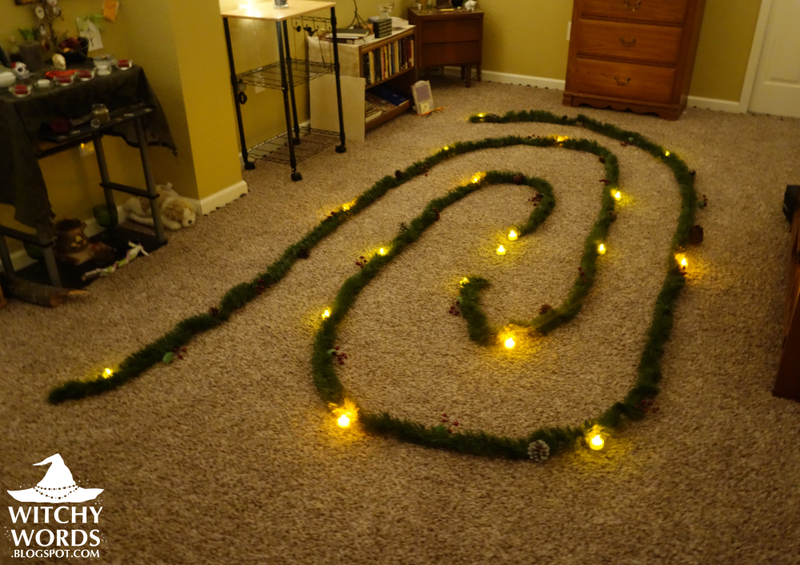 To reflect the coming of the light, I asked each member to periodically light a tea light somewhere in the room. 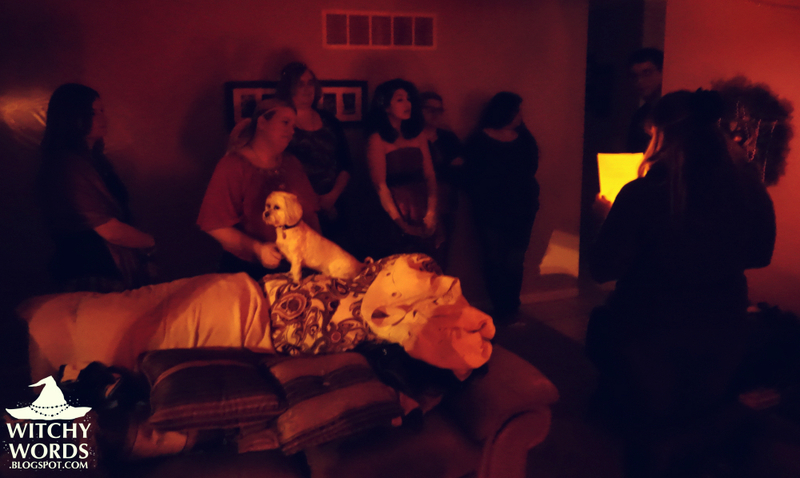 The first moment of lighting was directly after we invoked the spirits, deities and ancestors to join us. There would be two more throughout the ritual. Yule logs are a tradition rooted in Germanic paganism. Never bought, the Yule log must be given as a gift or be a portion of the first cut log for the first fire of the year. Sometimes, the log is even a portion of the trunk for the Yule tree! The Yule tree is charged with intent and hopes for the new year, then burned on the solstice night to release those intentions into the universe. I burn a Yule log every year but, this year, we're renting a house that doesn't have a fireplace. As a replacement, I came up with the idea of burning miniature Yule logs! I then asked everyone to choose a mini Yule log with a ribbon color most appropriate to their deepest wish for the longer days. They were instructed to charge this log and toss it into the fire. Once properly burned out, which didn't take long, the cauldron was carefully set to the side with the promise that everyone would receive a small vial of ashes in the future for Yule next year! 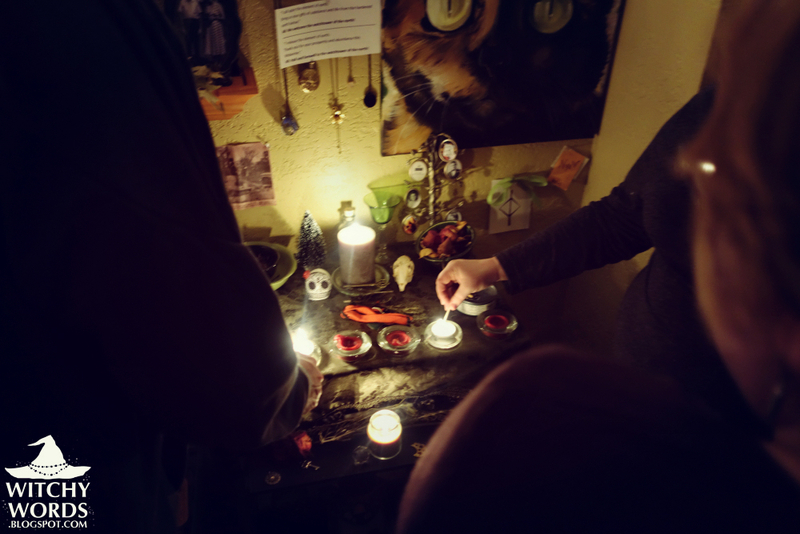 The music continued to play throughout the rest of the ritual as we took another moment to light a few more tea lights around the room. 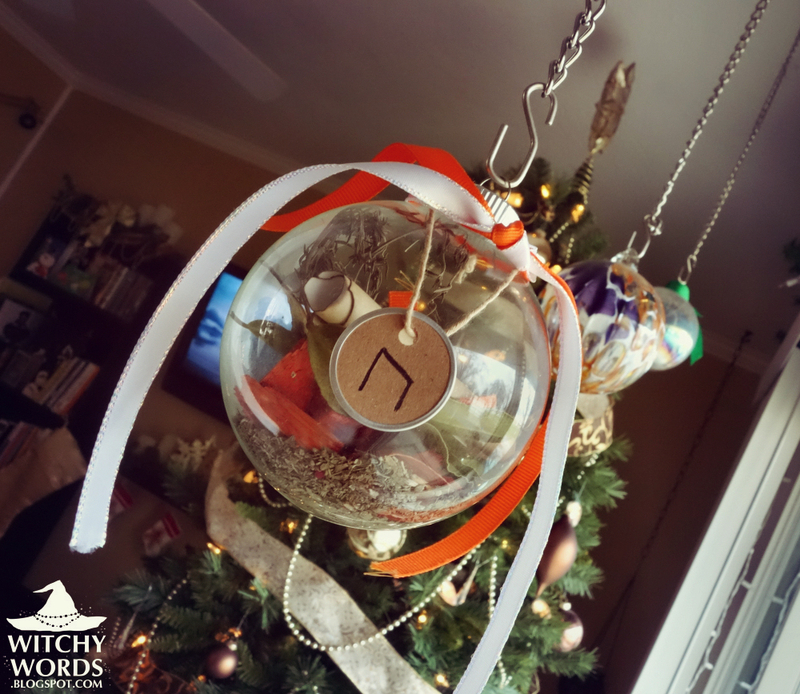 The next step of the ritual was to create personalized Yule spell ornaments! Typically, I like doing prosperity ornaments, but I opened up the intention of the ornaments for whatever purpose needed by selecting a variety of herbs, stones and ribbons. I even offered up blank tags so everyone could choose a rune best suited for their wishes! Fellow circlemate Jessica also brought a variety of herbs, items and stones for use. Thank you, Jessica! We began by taking a small slip of paper I charged with positive energy and writing our intentions on them. Once finished, everyone rolled them up and tied them with a small bit of ribbon as a way of charging them as well. We then all sat down with our ornament and begin filling them with herbs, stones and items appropriate for our needs. Once done, we dropped our rolled papers inside the ornaments and closed them up. Adding ribbon and a tag with a purposeful symbol on the outside, we finished by charging the orb. Everyone was instructed to take theirs home and hang them on their tree or in a window sill! 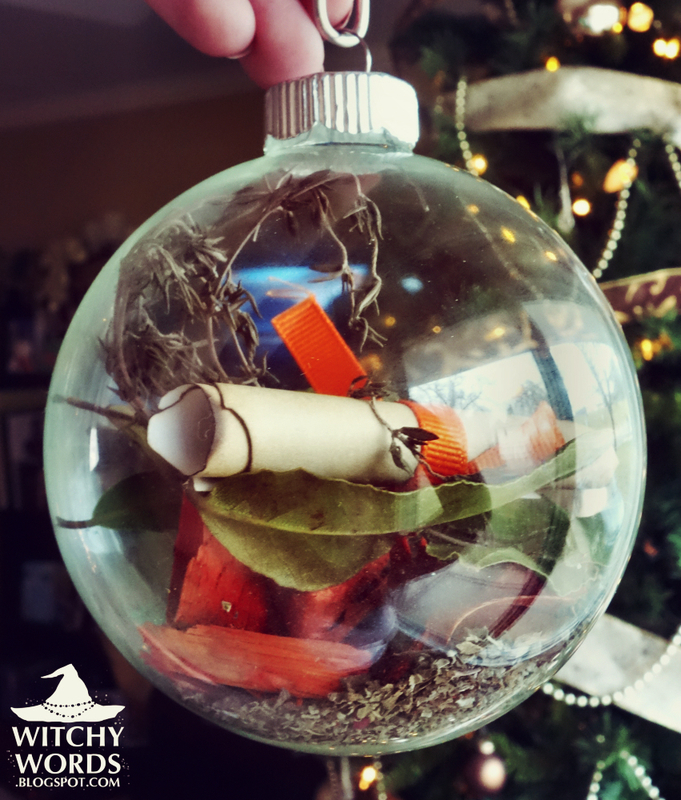 My ornament for this year was all about physical strength, vitality and willpower. 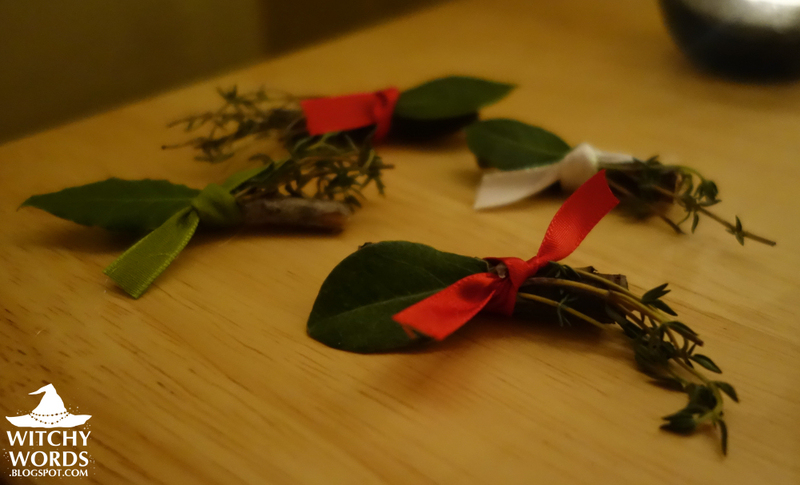 The herbs I included ranged from cinnamon, eucalyptus and thyme to infused rose petals and bay leaves. I themed the colors orange for vitality and white for purity, and was overall very pleased with the final result. Honestly, everyone's final ornaments were absolutely beautiful! If you'd like instructions on how to create a prosperity ornament, click here! "And now the day has come and the light returns to us. 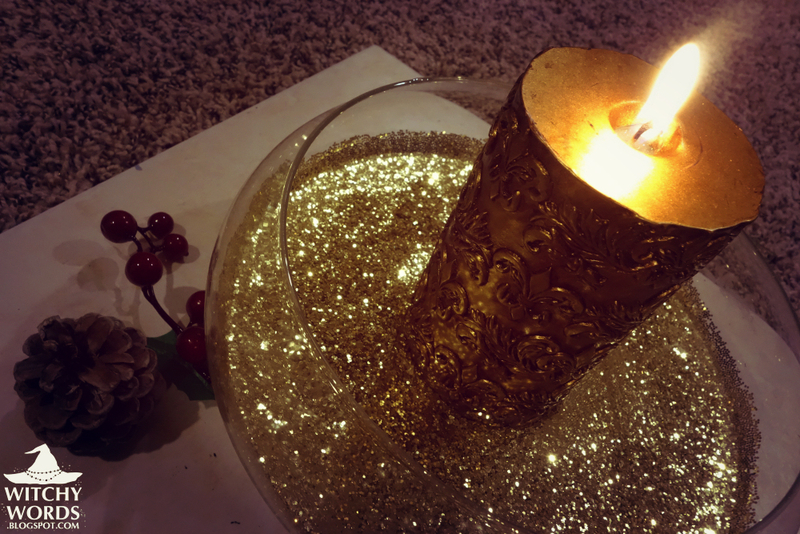 With this candle, I welcome it into the circle." I then lit the candle. "Let this orange juice, the fruit of the sun, represent the light and the warmth of the upcoming months." As we finished our orange juice, I instructed everyone that we would soon be closing the circle. Once closed, everyone would need to exit towards the southeast side, the side of the rising sun. There, they would find a very large wreath. 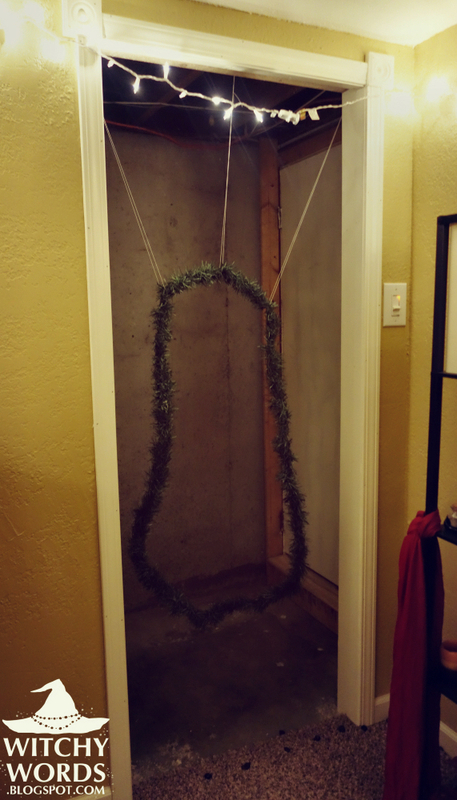 Carefully, everyone would step through the wreath, representing a transition from the darkness of the basement to the light of the upstairs! "Merry meet, merry part and merry meet again!" Everyone then "passed through the wreath" and headed upstairs. 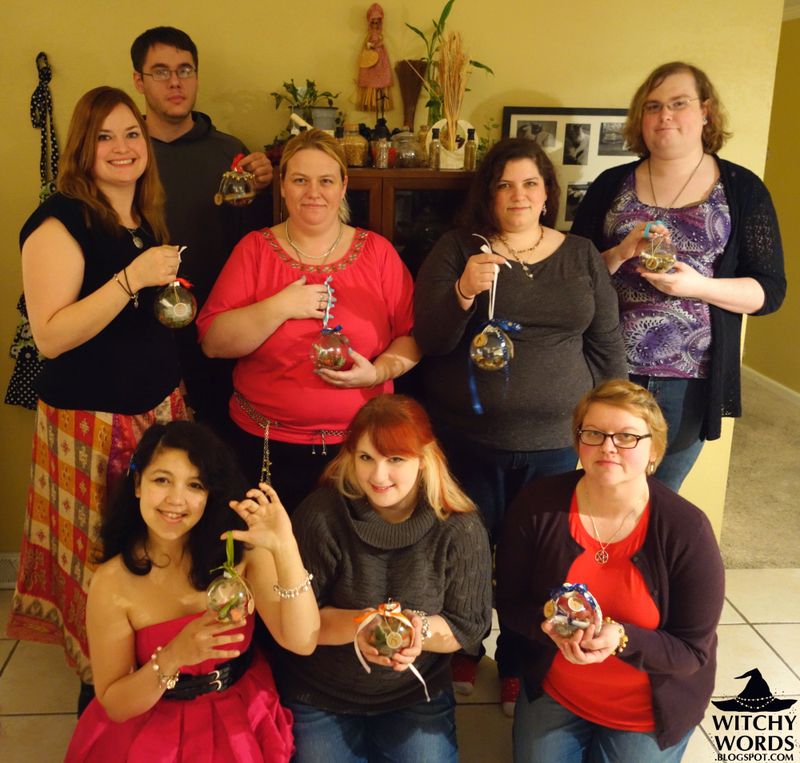 There, we took photos of our ornaments as a group and had our Secret Santa event! Gifts ranged from homemade aprons to Lush soaps and more. 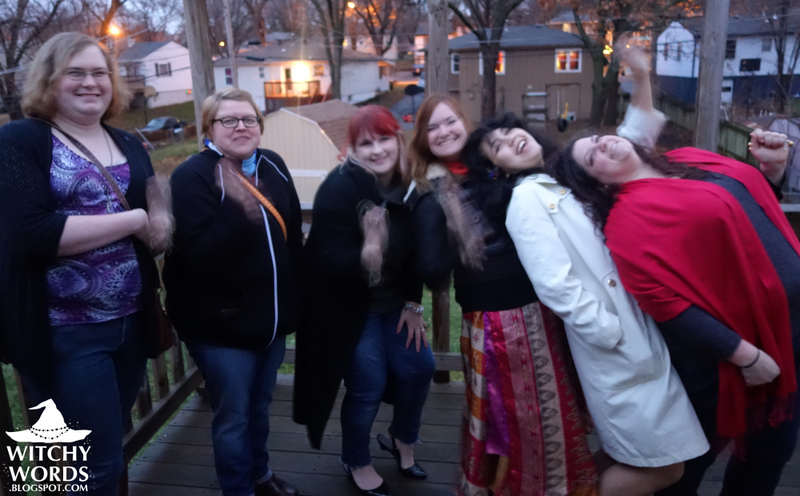 Everyone had such a fun time that we didn't realize how late it had gotten. Since most of us had to work in the morning, that drew our night to a close. 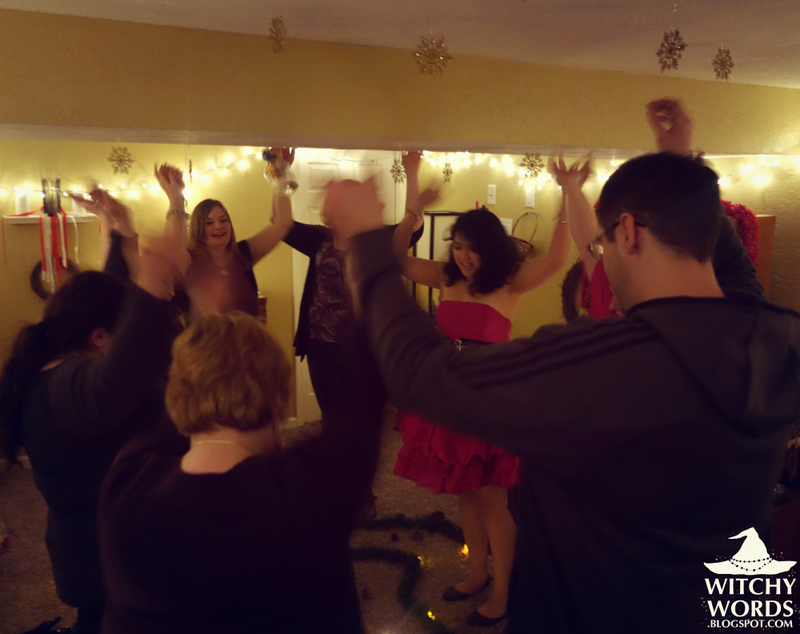 And that concludes the Circle of Fountains Yule ritual for 2014! 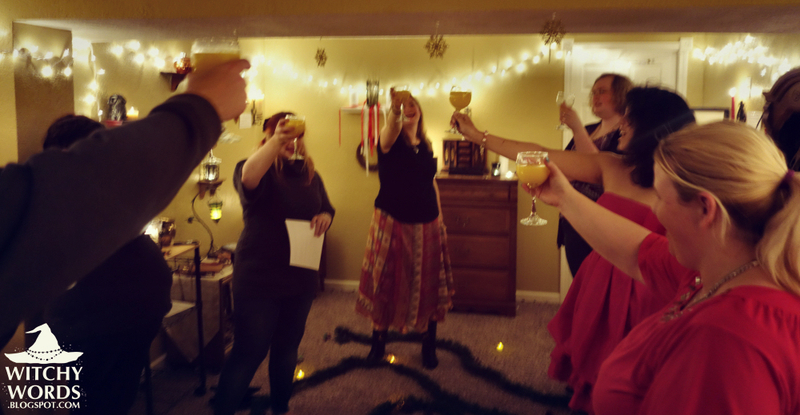 From my circle to yours, we hope your Yule was the best one yet! To see the previous sabbat, Samhain, click here! This is awesome! I love the ornament idea, and the mini Yule logs! Thank you so much, Anon! I truly appreciate it. Best wishes to you and your daughter!